He grew up listening to his mother’s sewing machine and he inherited her passion for making clothes. His road took him to Helsinki’s University of Art and Design (Aalto University) and his skills didn’t go unnoticed. Shortly after graduation he started working for the biggest names in the fashion industry from Dolce&Gabbana to Giorgio Armani and Bottega Veneta. 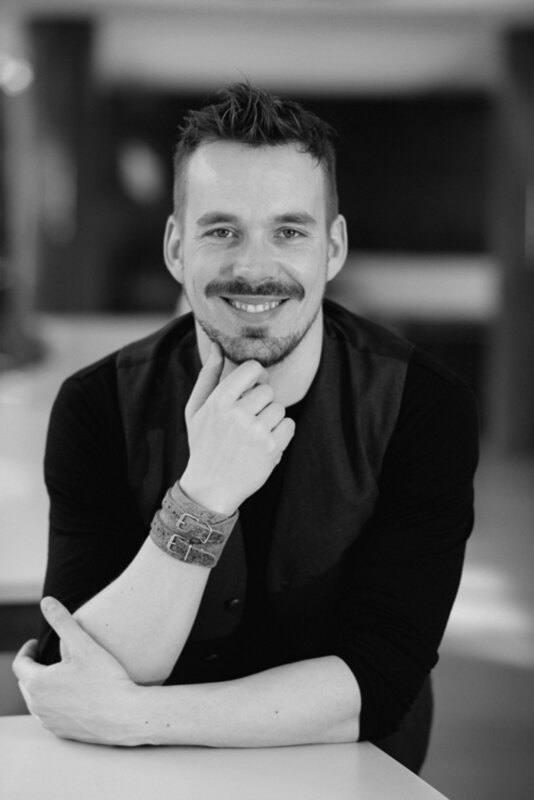 Teemu Muurimäki became an internationally known top fashion designer. 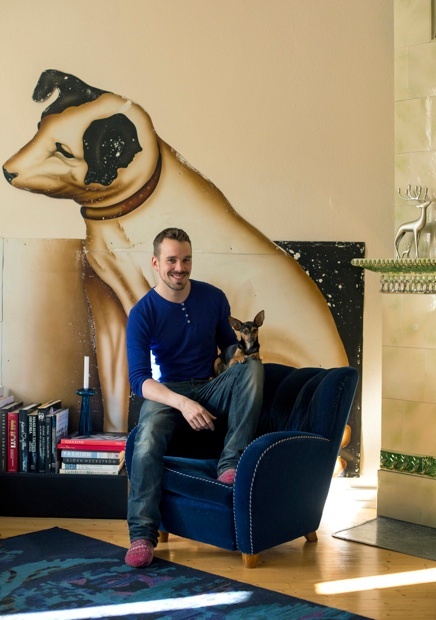 After almost 15 years of living abroad he decided to settle down in Helsinki with his Sydneysider ratter dog Jasper. In 2014, together with four friends, Muurimäki launched his own high-quality men’s collection Formal Friday. He is also known as one of Marimekko‘s designers. Well, at home. My mother was a seamstress and I used to take the leftover fabric pieces that she threw away after sewing. I made all sorts of things out of those small pieces of fabric. So I was pretty good at sewing already when I was a kid. When I went to high school I stood out because of my sewing skills. But for me it was just natural, it was like writing, I never even thought that it was something special or weird. Tell us about when you started working with mannequins? As a university student I was working in Villisilkki, a silk fabric shop in Helsinki. One day the window dresser didn’t come to work and the owner was desperate. She had to leave so she gave me the keys and said, “Do something”. There were two beautiful big windows and two mannequins. So with a pin I started to drape, and I loved that! For the next seven years I made window displays for that shop. People from the neighbourhood told me that they took evening walks and went past the shop just to see the window. That’s how I learnt the design technique of draping mannequins. Then you went to Paris? Yes, I started to work for Cymbeline, one of the leading European bridal wear companies. That was my first big fashion house. But after five years there I wanted something else. How difficult was it to get a job in other fashion houses? I tried to network. I had a contact in Paris. Every time I went to a bar or to clubs someone would say they would help me. But that never happened. In the end I used the Internet. How did you get a job with Dolce&Gabbana? I just googled Dolce&Gabbana headquarters, sent a cover letter, my CV and some sketches. I sent seventy letters; I was bombing everyone, HR, head of collections, creative director… I got about 30 letters saying no thank you. At some point I thought I could wallpaper my bathroom with letters from Dior and Channel saying “Monsieur Muurimaki, Non, merci…” But then I received a phone call from Dolce&Gabbana. The moment I remember for the rest of my life was when I flew from Paris to Milan and there behind the door I thought “Oh my god, it’s happening!” Because of my bridal wear experience I started working with celebrity evening gowns. You have a nice story about someone you drew as a kid. Tell us about that. I always liked drawing and when I was about 14 years old I gave my big brother a drawing of Iman, David Bowie’s widow. I saw her in some fashion magazine. About 15 years later I saw a picture of Iman wearing a dress I designed. That was one of those wow moments. When I designed celebrity dresses I was never told beforehand whom the dress was for. I’ve seen them after on celebrities but in pictures. You came back to Finland and launched Formal Friday. What’s that about? This is returning to men’s wear, which I always wanted to do. The name came from when I was working in Australia. My friends and I were always wearing t-shirts and jeans and our boss was complaining about how her designer team dressed. So one day we went to work with jackets and ties and it was fantastic because everyone loved it! We started doing it every Friday but with a relaxed twist. We called that day Formal Friday. In our Formal Friday clothing we use merino wool, which is durable and easy to maintain. It’s commonly used in outdoor and sports clothing. Merino wool is really big; I didn’t know that when we started. The designing process is like an unpacking process at its best. I don’t know where it’s leading me and I think that’s the only way to create something new. Once you create something it stays in your mind. It’s like having a library of ideas or elements in your head. It could be shapes, volumes, materials, and with experience you get more and more elements. Movies inspire me, travelling or seeing things. Even architecture can inspire me. Sometimes I have a picture of a building and I can start thinking what kind of dress could I make with that shape. I play with ideas. But for inspiration I think it’s important to get away from fashion. What do you enjoy most as a designer? When I’m working here in Finland I can do anything I want, wedding gowns, evening dresses… the best thing as a designer is to be able to do many different things. I’m really interested in how fabric moves, in its movements. I also enjoy making costumes for contemporary dance. I have made costumes for Tero Saarinen’s dance performance. Now I’m working on his next performance.